Two ways to position your email signature. Apple, Inc. Placing your signature is probably the easiest part of drafting your emails, and it's not only because there are no clear-cut rules for this part of email etiquette. 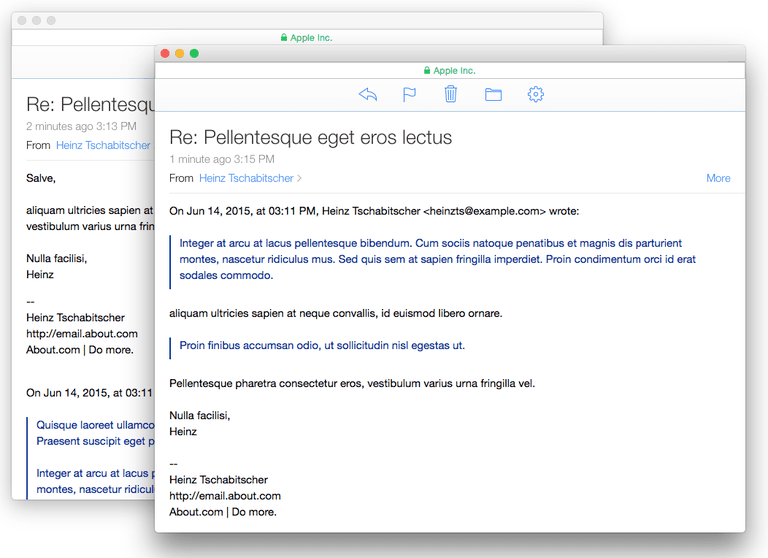 Put your email signature right below the end of your text—in replies as well as in new messages. Do this both in email you send professionally and those going to family and friends. Consider, though, not using a signature at all in private messages, as private correspondence can be more intimate than formalized messages using a highly structured signature. In replies, no signature or a condensed one are also good options; the recipient does, after all, already know you. If you include original messages using indentation and selective quoting, your signature will usually appear at the bottom of the message. If you quote lazily by putting your message on top of the (un-fragmented) original message, your signature will usually be between your message and the original message you quote, just above the "--Original Message--" line. The difference between lazy quoting and selective quoting is often a function of the email client you use or the standards of your profession. Linux-loving professionals, for example, often rely on selective quoting, whereas Microsoft Outlook defaults to lazy quoting. Putting your signature where it doesn't belong is hardly a major offense against etiquette, but nevertheless you should avoid common placement mistakes to reduce confusion. Signature on top, reply in line below: readers are conditioned not to look far beyond any signature they encounter. If your email program or service is set up to put your signature on top of quoted text in replies and forwards, do not write anything into the quoted text. Chances are, recipients will puzzle over your empty reply—but possibly not long enough to find your answers in the quoted portion. Instead, reply above the signature or move the signature to the very bottom. Signature at the very bottom, reply all on top: if you reply on top, but your email signature is at the bottom, recipients will either never see the signature or, if they see it, the signature can send them hunting for in-line reply text they might have missed. Instead: move the signature above the quoted part and below your reply. Your email signature is no longer than four or five lines of text and it contains the standard signature delimiter. Your signature is no wider than 75 characters. Avoid, where possible, including images, as some email programs treat embedded images like attachments and pull them out from the message itself. Naturally, positioning your signature in the suggested places gives you the option to include postscripts right below it. Note, though, that some email programs and services treat anything below the signature delimiter sas part of the signature itself. So, as an alternative, include your postscript below "signing" your message's main text with your name, but above the email's signature. How Do You Add a Graphic or Animation to an Outlook Email Signature? Did You Know That Yahoo! Mail Will Quote for You in Replies?